Jim and Teresa Anapol left a four-bedroom house in Stow for the convenience of a condo, here getting a new garage door. When David Quinn and Ana Anderson went looking for a home with a prime location and room for their school-age children, they didn’t end up settling for a sprawling fixer-upper. Instead, the family bought a new condominium in Newton with all the space they needed, top-end appliances, a patio — and a minimum of upkeep. Across Massachusetts, thousands of people — including families with children — are choosing condos over houses, giving up big backyards and privacy in return for less maintenance and more amenities, real estate specialists say. The price gap between condos and stand-alone homes has narrowed dramatically, to just $20,000 statewide in May — $320,000 for a median-priced condo, compared with $340,000 for a house, or a fraction of what it was at the housing market’s apex eight years ago. Condo prices this year increased 13 percent through the first five months of the year, compared with a 6 percent increase for single-family homes, according to the Warren Group, a Boston firm that tracks real estate. Statewide, sales of single-family homes declined almost 4 percent, compared with the same period in 2013, while condo sales rose 9 percent. 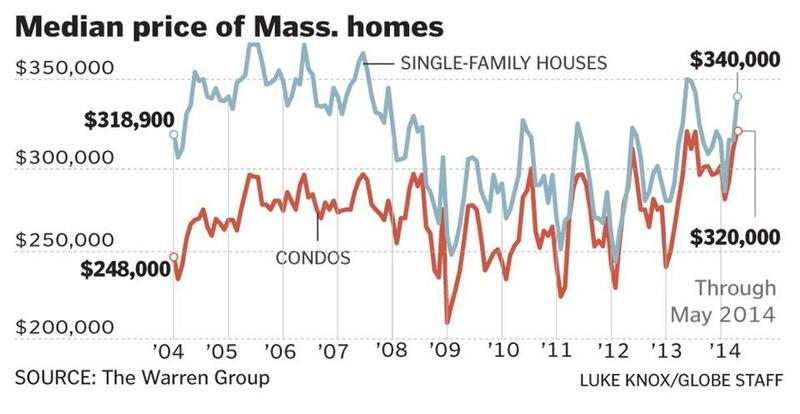 In downtown Boston, the condo market has been even hotter — too hot for middle-class incomes. The average price per square foot of $728 set a record in the second quarter, the Boston data firm LINK reported, 12 percent higher than the same period last year. And the average square-foot price for luxury units, which include concierge services and other amenities, rose nearly 15 percent, to $1,188. Prices in Boston have gone far beyond the Massachusetts median, locking many people out of the market. LINK said the average cost of a condo in the city’s core sections last quarter was $851,199, a nearly 17 percent increase over the same three months last year. More than half sold above asking price. LINK follows condo sales in 12 neighborhoods, including the Back Bay, Beacon Hill, the Fenway, the North End, the South End, and South Boston. Jamaica Plain, Allston, Dorchester, Mattapan, and other sections are not represented. Long considered starter homes for young couples or downsized destinations for empty-nesters, condos are now attracting people with children, real estate specialists say. The broader range of buyers has contributed to what is something of a renaissance for the market segment. “We’re experiencing this unprecedented level of demand for condominium living in Boston,” said Debra Taylor Blair, the president of LINK. Much of that demand, specialists say, comes from two groups: baby boomers who have sold suburban homes and are flush with cash, and young professionals entering the market. Both types of buyers want to be in or near the city. “A lot of people in their 50s and 60s and even older, instead of thinking of Boston as congested and dirty, they’re thinking of it as fun and inviting and innovative and lively,” said Timothy Warren Jr., the chief executive of Warren Group. “People eat out a lot more than they did 25 years ago, and the city has so much going on,” he added. In addition, condo complexes often feature pools, tennis courts, gyms, and common areas that can be used for parties. Also, a condo is more likely to be move-in ready than most single-family homes on the market, brokers say. “It’s easy to maintain the resale value because there’s a lot less maintenance needed,” said Gary Rogers, broker-owner of RE/MAX on the Charles in Waltham. Those kinds of selling points proved irresistible to empty-nesters Jim and Teresa Anapol. After 32 years in a four-bedroom house in Stow, they recently decided it was time to ditch the lawn mowing, snow clearing, and the endless list of chores that come with owning a house. But they didn’t opt to move to Boston. The couple bought a more affordable condo in Clinton, where they’re embracing a less stressful way of living. •Low inventory of homes hurting market in Mass.